The start of the Anglian League campaign began with a home fixture against neighbours Leicestershire. The Northants line up featured 5 changes from the last Anglain league match of 2017 against the same opposition. Retaining their places were Miles Mudge, Mikey Chambers and Callum Farr, then coming into the team were Wellingborough boys Jon Harris and Jamie Milligan, Michael Farr, Lee Hitchcock and Luis Witherall. These 8 were set to take on one of the favourites for the Anglian League, though we would include ourselves with this tag, so a competitive matches were guaranteed. A sensational spring day, with only light winds and juicy rough to challenge the players, greeted us following a torrential downpour on Saturday afternoon which prevented either team from practising for more than 6 holes – despite this the course was in fabulous condition, superbly manicured and all agreed at the end of the day how well the course played and looked. The foursomes matches got underway at 9am, with some late changes to the order due to ‘late arrivals’, so match 1 of Callum Farr & Mikey Chambers actually played at match 4. Therefore leading the way were Michael Farr and Luis Witherall on his Anglian League debut, followed by Miles Mudge & Lee Hitchcock and the final pair of Jon Harris and Jamie Milligan. The Northants start to the day, with late arrivals seemed to affect our performance in the early part of the day, after 4 holes 3 of the 4 matches were losing and after 8 all 4 were losing. The first positive news had to wait until 11 when Hitchcock and Mudge finally got their match back to all square, while the remaining matches were all behind. 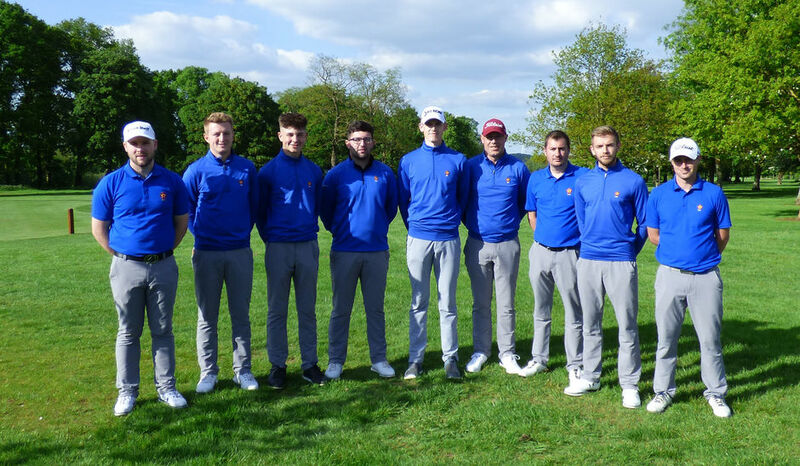 At this point the pairing from Wellingborough were beyond the point of return having suffered from inaccuracy and lack of putts going in the hole, combined with some very solid play from their opponents – a defeat of 7&5 soon followed. Soon after this Luis and Michael were also shaking hands on a 4&3 defeat, suffering from the slow start and leaving themselves far too much work to do once they had found their form. At this point, we were still at risk of losing all 4 matches in the session… the pairing of Mikey and Callum had fought back in their match to be level after 14 holes and at the same time Lee and Miles were leading 1up after 17 holes – however the experienced Leicester pair of Steve Sansome and Captain Martin Anderson would make an accomplished birdie on 18 to claim a half point. Back on 17, the Northants pair would make a bogey on the ever difficult 17th hole, which left 1 down and obviously needing to win 18 to achieve another half for the team. Despite 2 solid shots into about 20 feet, the birdie putt did not drop, leaving a 1 hole defeat and a crushing 3.5-0.5 foursomes series result. It was clear and obvious what was required from the 8 afternoon singles matches and despite the morning performance, the players were focused and determined to do all they could to turn the match around. The singles order would be Callum, Mikey, Michael, Lee, Luis, Jonno, Miles and Jamie – we required 6 victories to win the match overall. The feeling in the early stages of the afternoon, was the complete opposite of the morning – after 6 holes, Northants players led in the first 4 matches and despite Luis being on the wrong side of some inspired golf by Joe Hack (-4 through 6 holes), overall the picture gave us some optimism for the first time all day. Focus moved ahead to the 15th green/16th tee – news came through that Mikey had won his match on the 17th green and Michael had also succeeded, with a 3&2 victory – so we had won the first three singles matches, with one defeat at this point, leaving us behind by 1. Lee’s match reached the 18th tee, he was 1up. Both players hit the fairway, with Lee to hit his approach first, a beautifully controlled wedge which pitched into the slope and rolled back towards the flag at the bottom of the slope, leaving a 15 footer. His opponent, Jack Mayfield, was very slightly blocked out on the left side of the fairway, he played the only shot he really had and left himself a sloping 25 foot putt, which he would not hole, leaving Lee 2 putts to win his match, which he calmly managed to negotiate – scores now level, with 3 matches left on the course…. Jamie at the back was still in control of his match, Miles was 1 down playing at 7 and Jonno won 14 and birdied 15 to reduce his deficit to 2 down. Despite his best efforts Jonno couldn’t win 16 and was therefore dormie 2 down, Miles was also 2 down when he reached the 17th – unfortunately neither player made birdie on the hardest hole on the course and therefore could not extend the match any further. Jonno’s 2&1 defeat was soon followed by Miles’ 3&1 defeat and it was this point that got Leicestershire to the 6.5 points required for the win. This obviously left Jamie’s match on the course, 2 up playing 17 a fantastic pitch up the length of the green to tap in distance was enough to see his opponent concede the match. Leaving the overall score 6.5-5.5. That said, the fight shown by our team on this afternoon is something we should take forward for the future and maybe remember that the preparation before a days play is important to starting with the right mindset! We move onto the Eastern Counties Foursomes event at Seacroft Golf Club in Skegness this weekend. Hopefully our Foursomes form improves! Before we move onto the next Anglian League fixtures against Norfolk on June 3rd.